Diesel created a perfume that encapsulates the dangerous & rebel attitude of a bad boy who dares to play with fire: a very masculine fragrance for a man who lives for seduction and never gets enough. 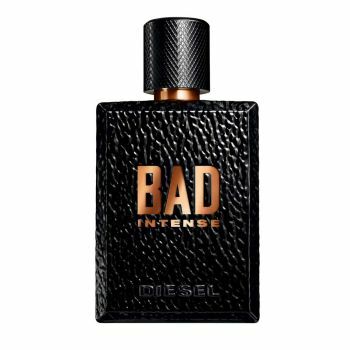 Diesel Bad Intense is a sizzling take on the tobacco-caviar signature of Diesel Bad’s fragrance. The scent reveals itself with a sharp sparkle of bergamot, cardamom and black pepper. Before you know it, a hot cocktail of saffron, nutmeg and cinnamon enflames the caviar accord. For even more sensuality, vanilla bean, benzoin and labdanum keep the tobacco and woody notes burning. The bottle exudes tough virility, as it is directly inspired by the iconic rebel perfecto. And because Bad Boys love to say it out loud, the BAD Intense logo is hot stamped in copper. Love shouldn’t be hot, it should burn.